UPDATE: Advance ticket sales will end at 3pm today! Any remaining tickets will be $8 at the door. Tickets to Sneak Preview #2 available here. 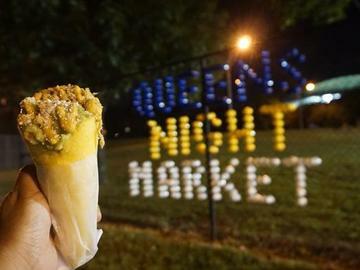 The Queens Night Market (queensnightmarket.com) will be free and open to all again starting on May 5th. WHAT TO EXPECT THIS YEAR: New food entries this year include: Thai Roasted Crickets; Mexican Tacos Al Pastor; Indian Parantha, Chole Bhature, and Kachori; Italian Porchetta; Moldovan Waffle Rolls; Brazilian Coxinha and Sonho; Peruvian Jalea; Laotian Larb; Wenzhounese Fried Chicken Feet Skewers; Thai Sai Ua; Filipino Dinuguan; Sudanese Sambuksa and Dakwa; and more! Returning food offerings include the always-popular Trinidadian shark sandwiches, Burmese palatas, Indonesian kue pancong, Ceviche, Persian crispy rice, Salvadoran Pupusas, Malaysian “ramly” burgers, Chilean completos and chacacero, Portuguese Pasteis de nata, Russian pelmeni, Ukrainian perogies and borscht, Romanian chimney cakes, Hawaiian musubi, Bardbadian fishballs, tacos de canasta, duck baos, jerk chicken, and much more. We still have a general $5 price cap on food, although a handful of vendors will be selling at $6. Art/merchandise offerings include Pusheen merchandise, Mexican handcrafts, small-batch soap, Quechuan handicrafts, NYC-themed apparel, designer umbrellas, stationery, fun travel kits, contemporary art, and henna. As always, we will have a great lineup of live music and performances, including resident DJ Lil Buddy, Batalá NY, Bridges and Powerlines, Flying Robin Project, and Loupakis Acro Gymnastics. We'll have games and activities for visitors. And we will have our popular Beer & Wine Garden, so bring your IDs if you're interested in adult beverages! Please note: ALL SALES ARE FINAL. The system does not allow us to cancel, refund, or reschedule.